A facial peel is a treatment designed to renew the surface layers of skin with the goal of correcting fine lines, pigmentations, and other small defects in the skin caused by aging. A chemical facial peel can be performed with different substances depending on the desired degree of depth. It is most common to perform a medium peel, for which we use trichloroacetic acid in varying concentrations. Not everyone is a candidate for a chemical facial peel. Appropriate patient selection is fundamental for ensuring a high degree of satisfaction. A chemical facial peel can be applied to the entire face, but it is especially useful as a complement to a lower blepharoplasty. Many patients who ask about a lower blepharoplasty have, in addition to fatty bags, wrinkles and hanging skin in the lower eyelids. In these cases, a facial peel is very useful for tightening the skin after eliminating the bags. Those patients who only have wrinkles in the lower eyelids, without bags, can be treated with a facial peel alone (chemical blepharoplasty). Before having a facial peel done, it is advisable to treat your skin for 3-4 weeks with substances like glycolic acid or vitamin A derivatives. These eliminate layers of dead cells in the skin and allow the trichloroacetic acid to penetrate deeper during the peel. If the patient has a history of facial herpes, we recommend a prophylactic treatment with oral antiviral medications. How is a facial peel applied? Chemical facial peels can be applied as an office procedure. The procedure lasts between 15 and 45 minutes. 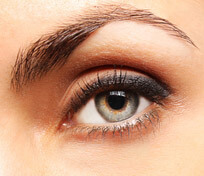 They can also be done in the operating room while performing another procedure, such as a blepharoplasty. The trichloroacetic acid is applied separately on the different areas to be treated and is later neutralized with frozen physiological saline solution. The average chemical facial peel is very similar to a sunburn; the skin will initially be red. In a few days, the skin will harden and turn darker, forming small flakes that will fall off in approximately 5 to 7 days, giving way to a new layer of skin that is tighter, clearer and more uniform. During this recovery period, it is important to keep the area moist using ointments. Once this initial healing process is over, makeup can be applied to hide the reddened skin, which usually returns to its normal color in a few weeks. It is very important to protect yourself from the sun in the weeks following the treatment to prevent hyperpigmentations.